BRONWYN CHESTER | Not Ghostwriter, nor Ghostbuster, nor Ghostwalker, though he's heard them all. No, the name is Ghostkeeper, an English translation of the Cree name Kanachakhtwin, meaning keeper of the spirits. It's a fitting name for a man who is trying to bring the spirit of aboriginal wisdom into partnership with the Western scientific way of thought. Elmer Ghostkeeper is McGill University's first recipient of the New Sun Fellowship, a two-year teaching and research position for a Native scholar whose objective is to bring an aboriginal awareness to subjects taught through the McGill School of Environment and to other disciplines. As Ghostkeeper says jokingly, he's a guinea pig in this new fellowship and, to some extent, both he and the University are still sniffing each other out. Aside from moderating one of the new interdisciplinary courses of the MSE, "Knowledge, Ethics and the Environment," Ghostkeeper will also be lecturing from time to time with professor of social and transcultural psychiatry Lawrence Kirmayer, who is part of McGill's Native mental health team. Ghostkeeper is also active at the First People's House, the University's centre for Native students, and continues his involvement with Alberta's Aboriginal Wellness Program, all the while raising his two 15-year-old sons and 10-year-old daughter with his wife, conference organizer Kim Ghostkeeper. The New Sun fellow's major desire for his time at McGill is to further develop and put into practice Wechewehtowin, a Cree word, pronounced Weegie-wiff-to-win, meaning, literally, "setting off together on a journey." Ghost keeper, a Métis from Paddle Prairie, Alberta, proposes a partnership between Native and Western ways of looking at the world -- an alliance that could help both aboriginal peoples and non-aboriginals find a better way of living with the living world, otherwise known as the environment. Ghostkeeper's ideas regarding Wechewehtowin began their long incubation 25 years ago, when he realized that he'd lost his spiritual connection to all living things -- a value the 51-year-old was raised with -- when he'd shifted from living with the land to living off it (a process lyrically described in his 1996 book, Spirit Gifting, his MA thesis in anthropology). At the same time, he began to understand the essence of aboriginal wisdom as compared to what he calls "Western scientific knowledge." Both have their strengths, he says, sitting before his computer in his office, a poster of the nutritional merits of traditional Native foods gracing his door. But the problem lies in the inequality of power between the two value systems, he says, citing a survey he conducted on traditional Native use of a piece of land under consideration for logging. At the time, Ghostkeeper was working in the aboriginal affairs department of Alberta-Pacific Forest Industry Inc. When he asked the forestry scientists how many edible berries they could name in the area, they came up with six. The aboriginals named 17. Likewise, when each group was asked about the number of medicinal plants, the consultants couldn't come up with a single species, while the aboriginals knew more than 100. "In other words, to [the Natives], the land was more valuable the way it is, where many species may be harvested over a long period of time, rather than harvesting a single species at the cost of destroying the other riches." This sort of evaluation of the value of a piece of land doesn't necessarily prevent the land from being exploited for the single species, but it can at least establish fair compensation practices, says Ghostkeeper. Pulling out the acetate overheads he uses to show the uses of Wechewehtowin, Ghostkeeper explains the merits of both aboriginal wisdom and scientific knowledge. "Using both belief systems is better than one; the latter is great for measuring things, he says, "but if a thing isn't measurable, such as the spirit or emotions of living things, it denies its existence." Aboriginal wisdom, on the other hand, says Ghostkeeper, includes human experience and believes that all life is sacred. Ceremony in his tradition has a place in many of life's passages, including illnesses like diabetes, which strikes half of all Natives. Three years ago he introduced Wechewehtowin to the Aboriginal Wellness Program to come up with a better approach to dealing with the disease. Adding such Native approaches to healing, such as pipe ceremonies and talking circles, to the Western "gifts" of insulin and precision in measuring progress, has resulted in "a positive outcome" at Edmonton's Royal Alexandra Hospital, says Ghostkeeper, who has also used Wechewehtowin in relation to economic development and the environment, and to Native mental health. 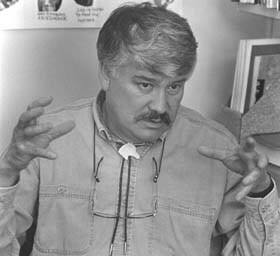 At McGill, Ghostkeeper's knowledge of an ecological way of life that has almost disappeared, not to mention his quiet, pensive manner and experience as a technologist (he first trained in civil engineering), business person, Métis leader and scholar, is gaining a following. Deborah Buszard, dean of the Faculty of Agricultural and Environmental Sciences, is very glad to have his take on Western science challenge the belief system that pervades much of her campus. "We're always generating new knowledge but we don't often go the next step and consider the implications of what we're doing. What Elmer Ghostkeeper will do is bring a much broader perspective as to our place as humans in the natural environment." Tim Johns, for his part, appreciates the Métis's moderating skills in the class he team-teaches, "Knowledge, Ethics and Environment." Elmer, who moderates the discussion-in-a-circle which follows the lecture, "ties things together," says Johns, a professor in the School of Dietetics and Human Nutrition. "He's very good at creating an informal, open atmosphere." Furthermore, says Johns, Ghostkeeper's experience of traditional Métis farming means that he has a particularly relevant contribution to make on the subject of land use, rituals and herbal medicine. "I'm looking forward to his contribution over the next four to five weeks when the subject will be indigenous knowledge systems." A number of the books on Ghostkeeper's office shelf have to do with wisdom. Favourites include Sherwin Nuland's The Wisdom of the Body, Peter Krass's The Book of Business Wisdom and Albert Einstein's Out of My Later Years. But as much as acquiring and recognizing the wisdom that comes of experience, Ghostkeeper strives to understand the process by which Natives and non-Natives alike lost their wisdom. To him, the question of living with the environment is as much and more a question of reclaiming the wisdom of individuals and collectives, as of finding the technical means. The New Sun Fellowship was established with the support of Joy Harvie Maclaren, who also funded the creation of a new endowed chair at Macdonald Campus. There will be more on Maclaren and on plant science professor Don Smith, the first recipient of the new chair, in our next issue.